Wrap yourself in the classical sounds of Christmas in one of Key West's most elegant settings, the Grand Salon of the historic Freeman-Curry Mansion, 724 Eaton Street. 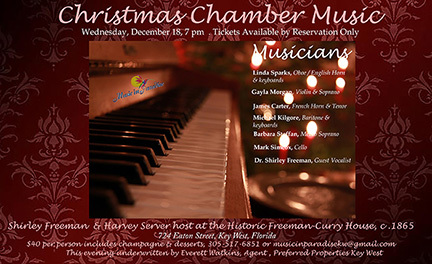 Hosts Shirley Freeman and Harvey Server have graciously opened their home this coming Wednesday, December 18, 7 pm for an evening with the premier chamber ensemble of Key West. 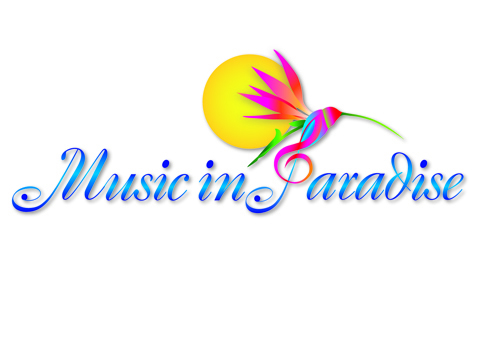 The all-star cast of Music in Paradise for this evening features Linda Sparks, Music Director, oboe, English horn and piano; James Carter, Tenor and French horn; Gayla Morgan, Soprano and violin, Michael Kilgore, Bass Baritone and piano, Barbara Staffen, Mezzo Soprano and Mark Simcox, cello. Dr. Shirley Freeman will make a special guest appearance with the ensemble. Each artist will be featured in his or her most beloved Christmas arrangement. Additionally, there are traditional settings of classic Christmas compositions as well as original arrangements by Sparks, Morgan and Carter. The champagne gala and concert benefits the Music in Paradise season and its annual awards concert for outstanding young artists in the Keys. This evening is generously underwritten by Everett Watkins, Agent, Preferred Properties Key West.